A key factor to the success of Cobblestone School is found in the active participation, involvement and engagement of our families. Parents are encouraged to engage themselves in many of the activities at the school, including those that lie at the center of the educational program. Classroom Visits: Helping in the classroom supports the day’s activities with teachers. 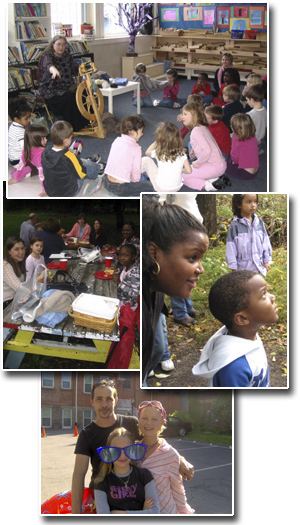 Field Trips: Accompanying the children to and from field trips, including transport. Mentoring:Meeting with students and explore subjects of importance to them. Presentations: Sharing your expertise, works, and interests increases the value of learning. Workplace visits: Inviting students to your workplace to share and show what you do increases interests and sparks excitement. Work Parties: Helping around the school to maintain the property. There are many other ways to participate in the activities of the school and committees are also keys to supporting Cobblestone. Members serve in various capacities and share their talent and time. Committees range from Personnel and Marketing and Development to Finance and Education. For a complete listing of committees, along with committee chairs, please contact the School Office for more details. Believing in the mission and vision of Cobblestone is one of the main reasons why families enroll their children at our school. While there are many ways to then participate at the school, one of the critical means is raising philanthropic support. This comes in many ways and includes one’s annual gift along with helping to raise funds through various events and activities. Here, parents participate actively in organizing programs – from the sale of Cobblestone clothing and apparel, bulbs and plants to Family Fall Fun, Spring Fling and other key events that attract families and other members of the greater Rochester community. From all of our families, we ask for their annual gift and then participation in our range of fundraising events. Both are important to our overall success!